I study the management of value-added supply chains. A supply chain includes a sequence of organizations that are involved in producing and delivering products or services. The goal of my research is to provide guidance to academia and practitioners about how to deliver the right product or service to the right place in efficient and effective ways. 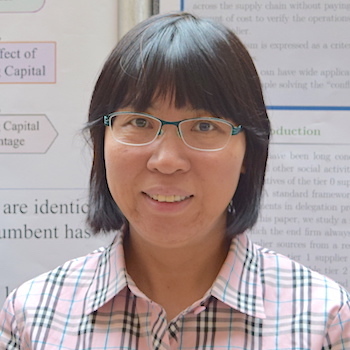 I am currently working with a postdoctoral fellow, Rongyu Wang, on a research project implementing sustainability standards in a non-verifiable supply chain. This is based on the observation that many suppliers thrive by reducing costs and focusing on economic incentives, often at the expense of social and environmental responsibilities. Recently we have witnessed examples of unethical and incompetent behaviour from suppliers, such as the use of child labour or hazardous working environments. A major challenge is how to contract with and compensate upper-tier suppliers so that not only the immediate supplier, but also the indirect suppliers (and thus the entire supply chain) are environmentally and socially responsible. In the project, we compare carbon taxes, which impose a price on emissions, and subsidy policies, which reward firms that reduce emissions. A paper describing this project is currently under review. From an academic perspective, this work is the first to examine both environmental taxes and subsidies in the context of multi-tier supply chains. From an economic viewpoint, we find that carbon taxes amplify financial loss, due to all firms in a supply chain marking up prices – meaning deadweight loss occurs twice or more, which harms the entire market. This doesn’t happen under a subsidy policy, which makes both manufacturers and retailers perform better. However, where it’s very costly for a manufacturer to reduce emissions, net emissions under a subsidy policy exceed those under a carbon tax policy. Therefore, a carbon tax results in higher social welfare than a subsidy policy when pollution abatement is expensive and emissions are high. If the government also has financial/revenue concerns, the subsidy policy will be even less favourable because it results in government spending rather than revenue. From a social welfare perspective, carbon tax policies outperform subsidy policies especially when emissions are high. However, if firms’ economic performance is the main focus of the government, then the subsidy policy is the better choice. Thus our results provide a theoretical background for policy makers when choosing environmental policy options.